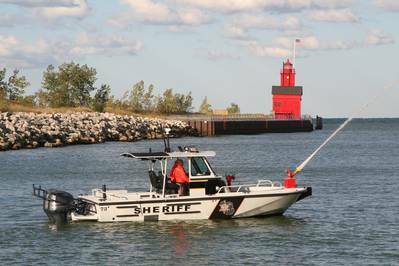 Brunswick Commercial & Government Products (BCGP) deliver a Boston Whaler 27' Vigilant patrol boat to the Ottawa County (MI) Sheriff's office. The Sheriff's office is tasked with law patrol, law enforcement, and fire suppression activities for the local river, which includes three harbors and a power plant, and to fulfill these tasks, the Sheriff's Office chose a commercially built Boston Whaler walkaround cabin model. The boat is powered by twin Yamaha engines, and includes the newest fire pump offering from BCGP, a 130 hp Mercruiser that mounts inside the cabin, leaving the deck clear. The pump can reach 120 psi, with a top flow rate of over 1,150 gallons per minute. The boat also features a starboard side rescue door to aid in victim retrieval or dive operations. The helm accommodates two officers and can be fully weather-protected. The boat was purchased with funding from a 2011 Port Security Grant, administered through FEMA. The Sheriff's office is tasked with law patrol, law enforcement, and fire suppression activities for the local river, which includes three harbors and a power plant. Headquartered in Lake Forest, Ill., Brunswick Corporation's Commercial & Government Products division supplies boats to homeland security, law enforcement, special operations and combat, and fire and rescue agencies.